The Frederick C. Robie House is a U.S National Historic Landmark in the Chicago, Illinois neighborhood of Hyde Park at 5757 S. Woodlawn Avenue on the South Side. It was designed and built between 1908 and 1910 by architect Frank Lloyd Wright and is renowned as the greatest example of his Prairie style, the first architectural style that was uniquely American. It was designated a National Historic Landmark on November 27, 1963 and was on the very first National Register of Historic Places list of October 15, 1966. 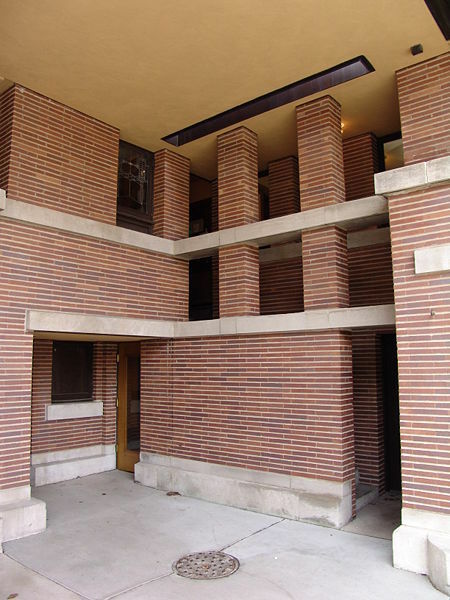 The Robie House is one of the best known examples of Frank Lloyd Wright's Prairie style of architecture. The term was coined by architectural critics and historians (not by Wright) who noticed how the buildings and their various components owed their design influence to the landscape and plant life of the midwest prairie of the United States. Typical of Wright's Prairie houses, he designed not only the house, but all of the interiors, the windows, lighting, rugs, furniture and textiles. As Wright wrote in 1910, "it is quite impossible to consider the building one thing and its furnishings another. ... They are all mere structural details of its character and completeness." Every element Wright designed is meant to be thought of as part of the larger artistic idea of the house. In 1908, Frederick C. Robie, a successful Chicago businessman, decided to have a “sturdy, functional and strikingly modern” home constructed for his family in Hyde Park, an elegant Chicago neighborhood and home to the campus of the University of Chicago. Robie wanted a house with an abundance of light and great views of the surrounding neighborhood, yet one that also maintained his family’s privacy. He didn’t like small confining rooms and thought that flowing spaces were essential in a well designed home. He soon realized Frank Lloyd Wright was the architect who could provide these elements; they were all part of the Prairie style that Wright developed. 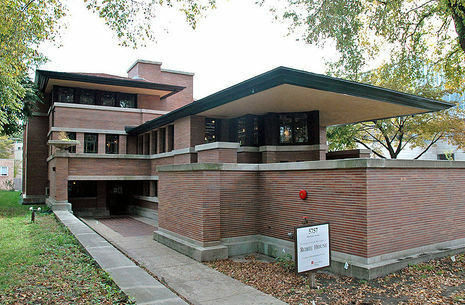 The Robie House site helped determine Frank Lloyd Wright’s plan. The corner lot is three times as long as it is wide. These dimensions caused Wright to think of the home in terms of long, narrow rectangles. In fact, the home consists primarily of two long and narrow “vessels,” each similar in shape to the hull of a ship, one set on top and slightly off-center of the other. When viewed from above, the two vessels are easy to see; however, from the street, each blends into the other, forming what looks like a single, continuous horizontal structure. The Robie House is constructed of red Roman brick and was one of the first residences to incorporate steel beams into its design. These strong beams were necessary to create the cantilevered balconies, which appear to be suspended in mid-air. The ground floor of the home was designed to take the wear and tear of everyday use, with a billiard room, playroom, and service areas. The first floor contains the home’s formal areas, including the living and dining rooms. These stretch in opposite directions from a central fireplace, a typical device in Wright-designed homes. The first floor also contains a kitchen and guest room. The second floor contains the private family spaces: three bedrooms surrounding a central hall. The first floor features a long balcony that stretches nearly the entire length of the home. When clients like the Robies asked Frank Lloyd Wright to design a home, they received more than just a house. Wright typically also provided designs for furniture, lighting fixtures, wall hangings, rugs, and, in some cases, even dishes and clothing. Frank Lloyd Wright strove to create organic architecture and relied on such detailed instructions to create a complete environment. Though Wright himself never fully defined organic architecture, it is an approach to design that tries to unite—or relate—all the elements of a structure, such as its site, materials, ornament and even the human users. Of course, achieving perfectly organic architecture was difficult even for Frank Lloyd Wright.